Forget Snoop, all eyez on digital Tupac! Tupac Shakur, like most artists, has been significantly more popular after death than he was while he was alive. Since being shot at age 25 in Las Vegas in 1996, Tupac has released a host of albums and songs, and I have no doubt that there’s got to be more in the tank for Tupac’s legions of devoted fans. However, music is the least of these concerns for Shakur and company. After all, he’s finally made a stage comeback. 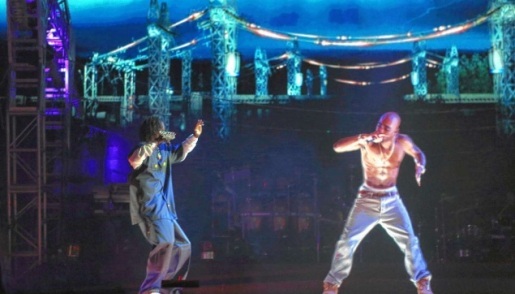 At Coachella, Tupac Shakur performed alongside living rappers thanks to the magic of special effects. First he started out with Digital Underground, now he’s just straight-up digital! The vision? Why an all-star concert tour hitting an arena near you, of course. Dre wants to take this show on the road, either with himself and Snoop, or with a whole host of A-list rappers and hip-hop artists, with digital Tupac as a star alongside his living compatriots. The company responsible for the Tupacogram is Digital Domain Media Group, the company that won an Oscar in 2008 for the special effects in “The Curious Case of Benjamin Button.” Granted, this Tupac is 2D rather than 3D, but still, it’s an impressive creation.